Electric Patient Lifters and Heavy Duty Patient Lifter. Scroll down to see our selection of Patient Lifters for sale. Patient lifters are equipment used to transfer patients with limited mobility. We carry a large variety of patient lifters including electric patient lifters, hydraulic patient lifters and stand up patient lifters for the home and clinical use. What is a patient lifter? 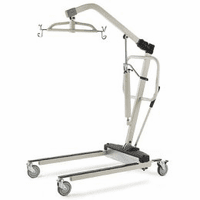 Patient lifters are an assistive device that allows patients in hospitals and nursing homes and those receiving home health care to be transferred between a bed and a chair or other similar resting places and may be either a sling or sit-to-stand patient lifter. Sling patient lifters are used with patients whose mobility is limited. Sit to stand patient lifters are designed to help patients with some mobility but that lack the strength to rise to a standing position. Patient lifters also allow a heavy patient to easily be lifted to reduce strain and stress on the care giver. For smaller facilities, a patient lifter means less staff members needed to transfer a single patient and care for others is not compromised..